I was driving the old girl the other day and the fan started by itself I had the switch on I then turned it off. I checked the volts going to the fan motor at the motor only showing 7volts. I then tinkered with the switch as I thought the negative wire may be bad. I then heard a pop sounded like a fuse I checked the fuse and it looks good ??? Did another check on the volts going to the motor at the motor NO volts. I then checked the fan with external power supply and yes it works. Dose it sound like a bad earth??? I also changed the thing that goes into the heater box that controls voltage. You can see one side of the blower motor wiring (wire labelled 181) should have 12V whenever the key is in the ACC or RUN position, so that's the first thing you can check. If that's OK, you can bypass the fan switch and test full speed operation by grounding the wire labelled 913 where it plugs into the heater resistor block. check the speed control resistor pack. Re: 1968 Heater fan not working found a problem ?? - at the fuse box? - at the brown wire going into the fan motor in the engine bay? - at the resistor block on the front of the heater box? Once we know that we can provide some advice. At the brown wire in the engine bay to the fan motor reading 2.3 volts on my multi meter. 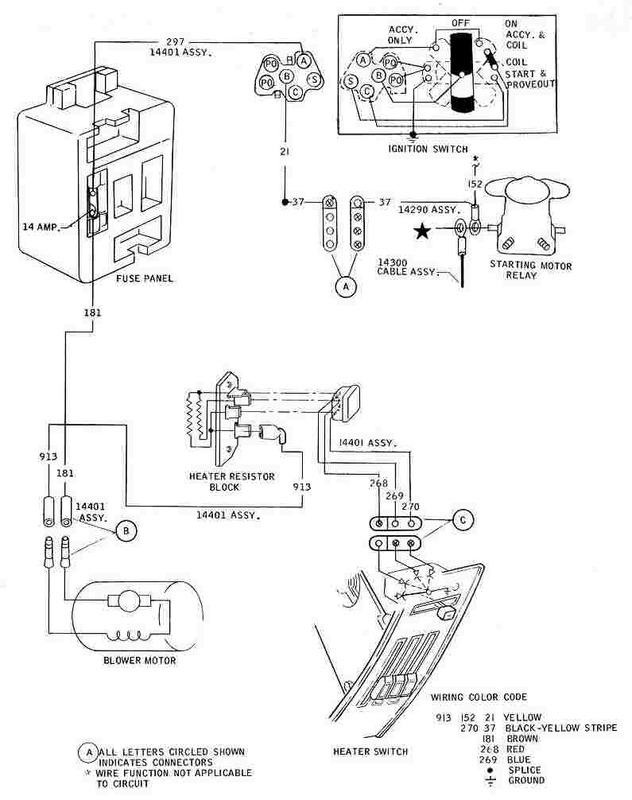 Sounds like the brown wire may be bad somewhere between the fuse box and the plug in the engine bay. disconnect the fan then connect 12 volts directly to it to make sure it works properly. if it works properly connect 12 volts to the appropriate different posts on the resistor to make sure it works. clean the crap out of the posts on the fuse box the fan fuse mounts in. you can have a dirty connection that shows 12 volts but wont run the fan. ask me how i know this, lol.